At Holidaysafe, we’re always interested in the ever changing travel habits of our customers, and at this time of year it seems that everyone is thinking about Christmas Holidays and heading to the slopes. To help us ensure we’re constantly on the travel pulse, we’ve launched a quick survey to gather information about winter travel plans for 2014/2015. 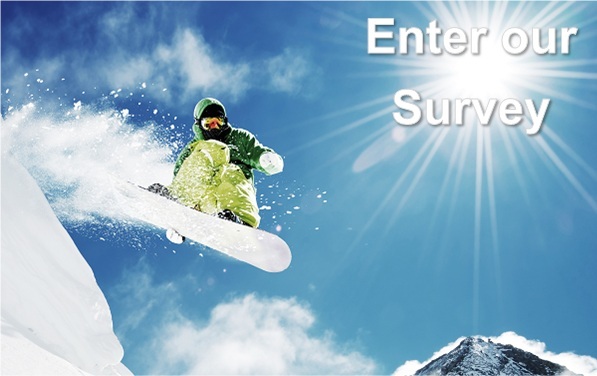 Whether you’re a Holidaysafe customer or simply a lover of winter holidays, please complete our very quick survey, and as a special thank you, we’ll automatically enter you into a prize draw to win a £50 voucher from Experiencedays.co.uk. Hurry! The prize will be released when we reach 200 responses, so make sure you tell your friends. Unlike other vouchers which tie you down, this voucher will allow you freedom to choose from all activities on the Experience Days website, whether you’d love a spa day with the girls, or some stunt driving with the lads! For more information, please visit the Terms and Conditions below. 1. Users must visit the Holidaysafe Winter Sports Survey Monkey page to complete the winter sports survey. Any answers to the winter sports survey received via an alternative means other than on the Survey Monkey page will not be accepted. 2. Users do not have to have purchased an Holidaysafe Travel Insurance policy to enter. 1. The Prize for the competition is a £50 e-voucher for Experiencedays.co.uk (“The Prize”). The Prize is non-negotiable and cannot be exchanged, upgraded, transferred or refunded for a cash or physical alternative. However, if we are unable to obtain an Experiencedays.co.uk voucher, for any reason, we will choose a subsequent alternative prize of the same value. 5. The Winner will be sent their Prize via email in the form of an e-voucher. 2. Holidaysafe and Infinity Insurance Solutions Ltd is no way partnered with or affiliated by Experiencedays.co.uk.